What is asphalt resurfacing? Asphalt resurfacing is installing new asphalt on top of existing older asphalt, also referred to as overlay. It is typically between 1.5-2 inches thick and gives the appearance of a new paving project but at a fraction of the original investment. 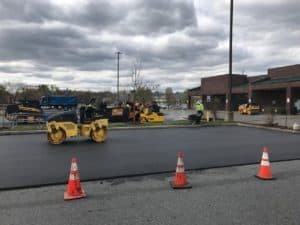 Resurfacing your parking lot will fix unsightly cracks and potholes while at the same time extending the lifespan for up to 7-15 years; However, the substrate does have to be in stable condition for an overlay to be applied. Not all existing asphalt parking lots have to be excavated and removed. Some can be repaired and new asphalt can be installed on the top. This is very cost efficient. When a quality parking lot is well maintained and in great shape customers and visitors do not even consciously notice. However, they will appreciate the ease of access to the business. Conversely, if a parking lot is cracking or has potholes potential customers notice and often make judgments about the business attached before even walking inside. Nevertheless, business owners are hesitant to repave parking lots due to the initial cost of their investment. Capital Paving & Sealcoating has a cost-effective solution to resurface your parking lot while extending its lifespan protecting your investment for years to come. When does asphalt need to be resurfaced? If there is standing water on the asphalt pavement (grade depressions) or large areas with a series of interconnecting cracks (looks like alligator skin), it’s time to have a professional take a look. Parking lots, as well as any paving, get weathered over time. They get worn due to varying temperatures of heat and freezing, the amount of traffic, and the weight of the vehicles that go across it. This eventually results in oxidation (asphalt turning grey instead of black), cracks, potholes, and depressions consequentially lessening curb appeal and property value. Cracks and potholes could also be indicative of some other underlying issue that needs to be inspected. As stated before, less curb appeal affects your business’ first impressions. This could mean less revenue for your business but could also result in unexpected out-of-pocket costs due to liability. Potholes can damage vehicle’s tires or their frames and you can be held liable. Furthermore, pedestrians or those on bicycles, etc. could step in a pothole and acquire a personal injury. 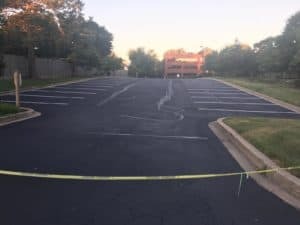 Resurfacing your parking lot can prevent these kinds of incidents while at the same time ensuring your area of business meets federal and state codes and compliance(s). Although your parking lot may be beginning to look less than appealing it does not mean that you must completely excavate and repave the entire area. It is recommended, however, that if your paving project is reaching 20 years old to consider repaving completely. 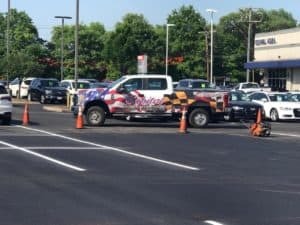 Capital Paving & Sealcoating understands the hesitancy of not repaving your parking lot, but it is important to maintain it to extend its lifespan. We are here to help you assess which solution is best for your needs. We are a family-owned business that started in 1956 and we are thoroughly experienced in our industry. It is our goal to provide your business with an optimally functional and aesthetically pleasing parking lot. 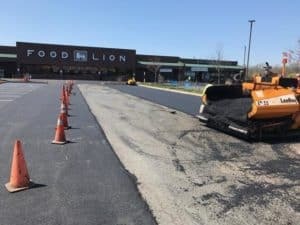 Capital Paving & Sealcoating not only offers original paving, but we also offer the cost-effective solution of resurfacing, maintenance, filling cracks, repairing potholes, line stripping, and more. We offer free estimates and work with you individually to provide you with a detailed scope of work. Don’t underestimate the value of the outside appearance of your business because it is what gives your customers the first impression of what services you provide. Call us today for a free estimate and let us help you begin planning your investment!